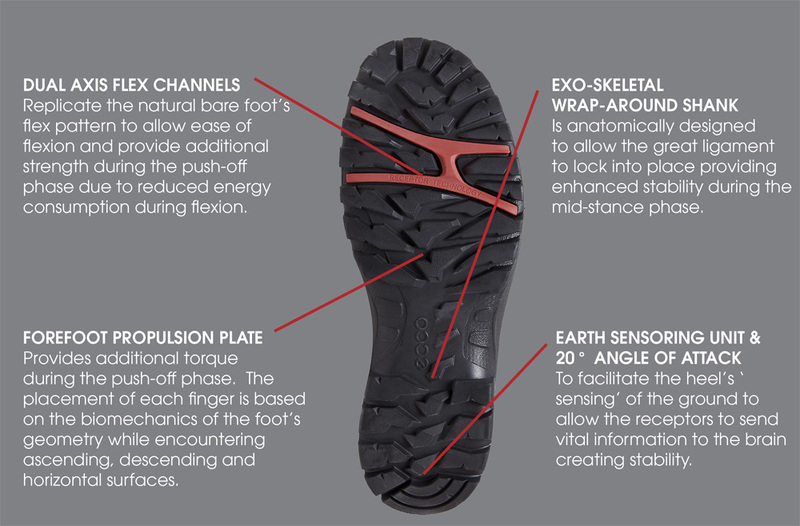 ECCO’s Receptor® technology is based around motion and comfort - the outcome of a two year study on the bare human foot and the receptors located in the foot. This helped us identify the philosophy “Every time you take one step, your foot takes three”. Your body is covered with super-sensitive nerve endings called receptors which help us to 'feel' the world. Receptor technology defines a realm beyond mere comfort where your shoes enhance your experience by encouraging your feet to move precisely the way nature designed them to. Our Receptor® technology mirrors human motion and enhances stability, this helps to cushion and support the wearer whilst walking. Receptor® technology is available in a wide range of performance shoes and is designed to reduce muscle fatigue. Rather than restricting your foots movement our shoe moves with your foot and offers wearers with more flexibility.